The window looks directly out on to the runway. It reminded me of a scene from Top Gun. Was having lunch at Haneda Airport today and took some photos of the Kihachi restaurant where we ate. I was trying to use my mileage points before they expired should JAL go bankrupt. Not sure exactly what the Government has planned for JAL, but even if the planes keep flying, the shareholders and milage point holder probably won’t be left with much. That being the case, I decided it was time to eat the cake before it went off. 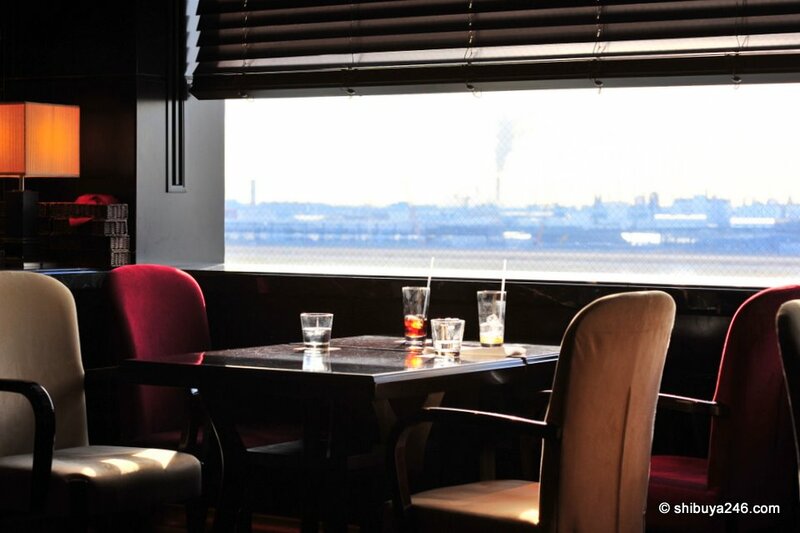 Kihachi is one of the better restaurants at Haneda Airport. Their pasta is great and their deserts fantastic. I couldn’t decide which pasta to get and in the end went for a tonkatsu sandwich instead, although the steak with yuzu pepper sauce almost drew me in. Tonkatsu sandwich on a Kihachi plate. Very tasty. I liked the light on the floor in this scene. The blinds on the window were automatic. They kept opening and shutting, moving up and down as the sun moved around. It was a bit of a distraction but made some nice colors for the photo. Forgot to take the picture before I had already eaten half of this strawberry truffle. Thanks to this electronic payment device, I was able to charge the meal against my mileage points and not take any cash out of my wallet. Thanks JAL for all the years of flying that allowed me to buy this meal. Since I didn't eat much when I flew this was a good reward. The front entrance to Kihachi at Haneda Airport, 5F JAL terminal domestic. The menus on display at the front of the store. Are there any good restaurants at your local airport? One of the best dim sum “meals” I’ve ever had was in the Thai Air biz-class lounge in Hong Kong international airport. Six different kinds of dim sum plus stir fried noodles, steamed veggies, etc. Better than anything I’ve eaten on the airplanes themselves! There is a Korean style bibimbap place on the 5th floor in Narita Terminal 2 (International) which is a god send for arrivals. All that hot spicy rice is perfect after a long flight with crap airline food. It restores so much energy and it’s reasonably priced. Katsu sando on the menu. Have never had Truffle before. Will have to introduce to me if I ever make it there. Can this be used in the gift shops also? RT @tweetmeme Kihachi Lunch at Haneda Airport, Japan Food | Shibuya246 http://bit.ly/577buT Very good selection of photos. To bad about JAL. I really like the photo w/the lights on the floor. Also the blinds on the windows would probably drive me bonkers also. Love the strawberry truffle. Great pics.